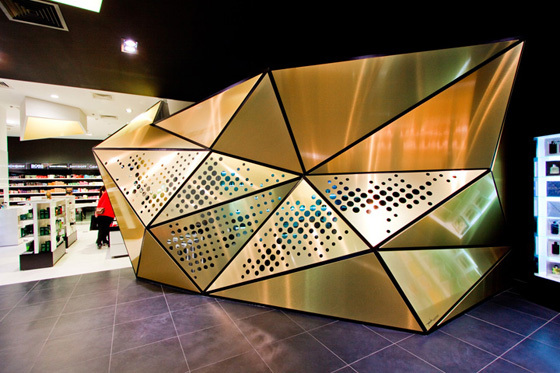 Within the Frivol Perfumery flagship store is a multi-faceted golden wall, designed by Polish interior designers Theza. The wall is placed to separate the beauty salon and back office from the rest of the store. The wall can be seen throughout the store, and with areas of perforation, the salon can be glimpsed from the other side. The gold structure dominates the space. The exterior has a brushed gold finish, while the interior is white. The three-dimensional structure is attached only to the floor and partly to the wall. Although the structure was created using hard substrates, an alternative would be to utilize frame and textiles. This would have allowed for a lighter weight option, still allowing the metal-look and perforated design.